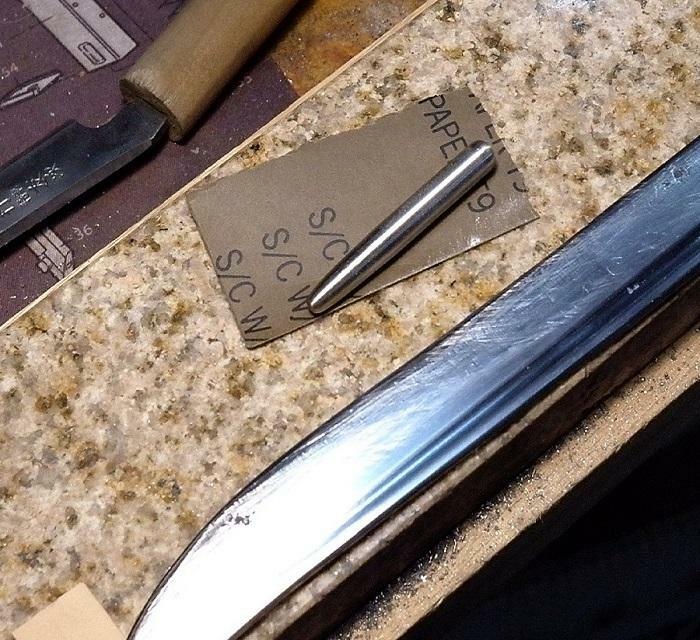 So, I am trying to make a tanto, Kamakura period style. I have made the steel, and am closing in on the desired shape. I would like to put "hi" grooves on the sides, but have no idea whatever how to do this. Any help would be appreciated. Look up how to make and use a "sen". I am now working on that, thanks. I was about half way to inventing something similar, but with a little carbide "tooth" to cut the grooves. I've known makers who use a metal lathe bit as the cutter. a lathe tool bit holder is super easy to make.. The vintage ones use a special wooden holder for the chisels which are really more like metal wood gouges than what we would consider metal chisels.. and it uses an adjustable back stop that runs along the back side of the blade thus keepng the line straight to the curve.. I used to have pictures with measurements of the 1 I made but it and the measurements are long gone..
Once the grooves are cut they are burnished.. I made a sen, which worked surprisingly well. I also made a little holder with a reground drill bit as a cutting tool. I ended up making some mistakes, so now I am working on one wider groove instead of two. It is disappointing to stray away from accurately following my original goal, but this is my first time making my own steel, and I guess I can use this as practice for my next attempt at accurate historical replication. The biggest issue I have is that the bit in the grooving tool tends to skip a little unless it is kept super sharp. I am working from the muni down. My understanding is that I should leave at least 1mm flat on the edge before tempering. I have a pretty good thermostatically controlled kiln for the hardening process, so hopefully i can get the hamon process right without screwing up too badly. 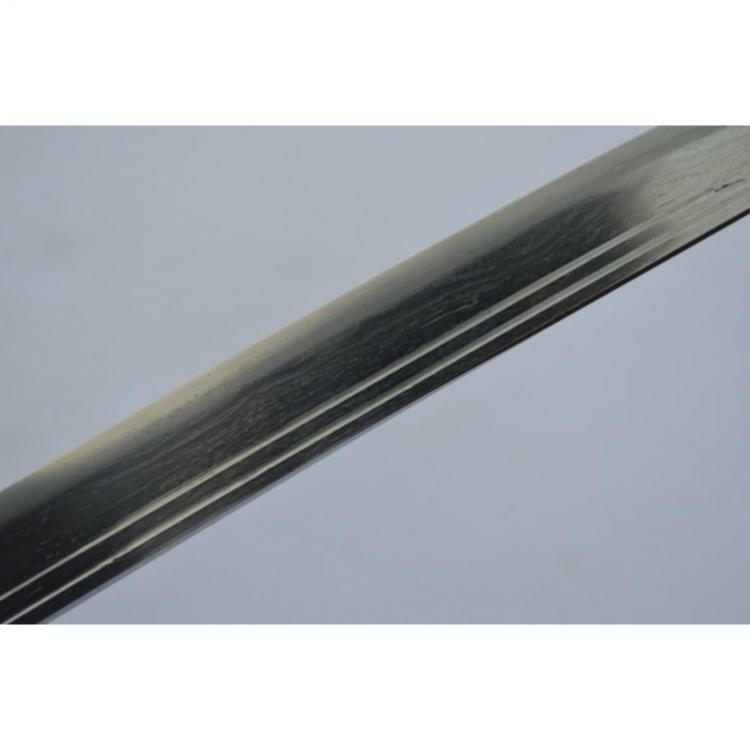 Several things to note and to keep in mind.. traditionally, The blade should be to full shape before setting the grooves and just about fully polished... Also depending on the Hamon, the grooves are put in after hardening.. From the looks of it you are doing a tanto.. I can see your edge is still wavy.. the tops of the gullet should be sharp vs rounded and the lines should be crisp.. They are not sanded but burnished.. thus creating a nicely polished surface without the damage of sand paper or soft edges.. The grooves are put in with a constant down force applied in longish strokes.. As long as you can get at 1 time without changing position.. then the process is repeated starting higher than the last placement.. I'm not being critical, just sharing from information from experience and research.. I ran grooves on early blades and found them to be nice and light cutters but to light for my use..
Nice start so far.. Keep it up.. I don't bruise easily, and I can use all the advice I can get. 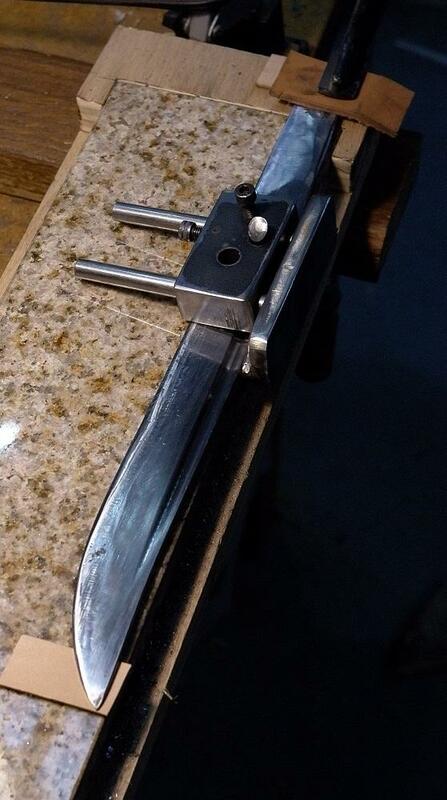 My idea was to cut the grooves, then do final thicknessing of the blade, to leave sharp boundaries on the grooves. I started sanding in some bad spots, but am now burnishing with the steel spike. I have not done any real work near the edge yet. I was afraid that my grooving work was going to be so disastrous that I would have to start over. 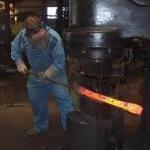 I did practice grooving on a piece of steel, but it was softer than the blade I am working on. Also, I made the cutting bit out of HSS. I will take the time to make a carbide tipped bit next time. And I probably should gone ahead and put a decent handle on the tool.